Various finish options for stainless steel including orbital (standard), bead-blast, electro-polished and painted. Available with plain sides and up to 4 gland plates. Gland plate thickness 2.0 mm – 6.0 mm. Available as empty enclosures or with terminals. Fitted with internal/external M10 earth stud. Fitted with external wall mounting brackets. The top brackets are slotted for ease of mounting. Block hinges and detachable hinged lid on CEX3 sizes and above. Padlock hasp door locking facility on enclosures with hinged doors. CE-TEK is able to manufacture non-standard sizes across a wide range of materials. CEX enclosures are designed to meet the highest standards for equipment protection with ingress protection levels: IP66, 67, 68 and 69K and IP66 as standard. CEX enclosures are often specified by engineers and designers when their project or installation requires a robust enclosure that will withstand harsh environmental elements and temperature extremes, which affords minimal post installation intervention and maintenance. CEX enclosures were purposefully designed to meet these demands and can be found on oil and gas installations and other hazardous/non hazardous sites worldwide. 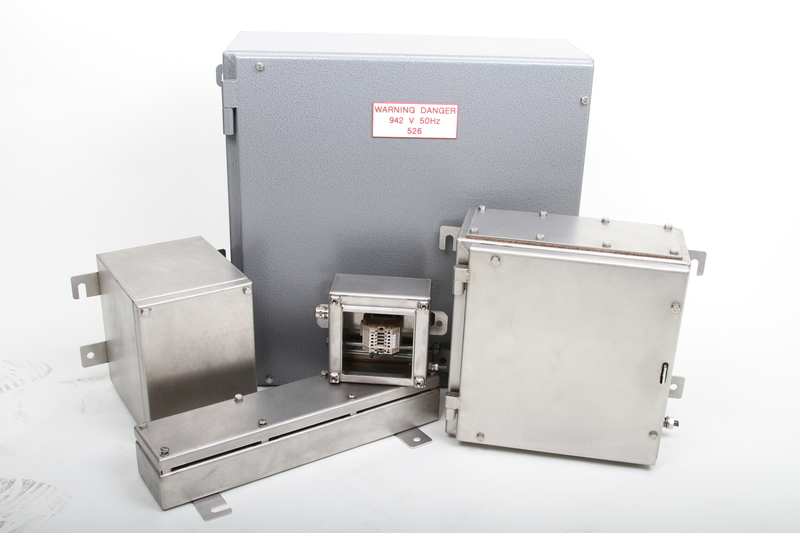 CE-TEK’s flexible certification ATEX provides a wide scope for manufacturing various standard and non-standard size CEX enclosures up to 2000 x 2000 x 600 mm. CEX enclosures are available in special sizes and also in fire rated versions.